If you want to sell your house in Tucson, you have likely seen many homebuying companies out there wanting to purchase your home. However, not all buyers are the same. In our latest post, learn more about how to separate the good home buyers from the bad ones! You might not know that you have many options when it’s time to sell! For many buyers and situations, a direct sale might be the way to go. However, before you sell to a professional Tucson home buyer, take some time to learn about the company’s background. Different buyers operate in different ways, but no matter how they operate, you need to make sure you can trust them. Keep reading to learn the signs of a trustworthy home buyer in Tucson. You don’t have to rule out a company just because they are new to the game. Everyone has to start somewhere. However, a company that has been around for awhile likely has streamlined their process and is obviously doing something right to still be in business. A company with a longer amount of time in business will likely have more knowledge and local market experience, allowing them to pay you a fair price for your Tucson house. Any great home buyer will be able to provide references from past clients. Don’t rely solely on the top reviews they have cherry picked. Asked to get references from their last 5 transactions if possible. This will allow you to get a better grasp of what people really think about the service. Create some questions ahead of time and consider asking some out of the box questions. This a big transaction, and you will want to make sure you are choosing the right buyer for your Tucson house. There should never, NEVER be any high-pressure sales. Companies like We Buy Homes In Tucson provide information and alternatives to a traditional sale. We offer fast closing to people who need it! However, we know it isn’t right for everyone, and that is completely ok! 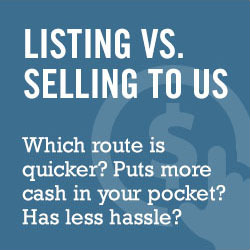 We ultimately want you to make the smartest, most well-informed decision when it’s time to sell your house. We will never pressure you or talk you into something that is not in your best interest. We invite you to get an offer, then take some time to compare yor options for yourself. We will happy to fully explian our offers and how we arrive at the prices we do. The process should be easy and transparent, at no time should you feel pressured into a sale.